This is my second bike, I got it 3 months after I started riding because I really cannot stand having this wonderful weather and wanting to ride and wanting to do work at the same time. Just does not work out properly. So, I got this bike because it was cheap, it shouldn't be too hard to work on, and it should turn out pretty when all done. Once again, a little less talk and a little more pictures? The bike is currently not running, but the motor turns over easily. 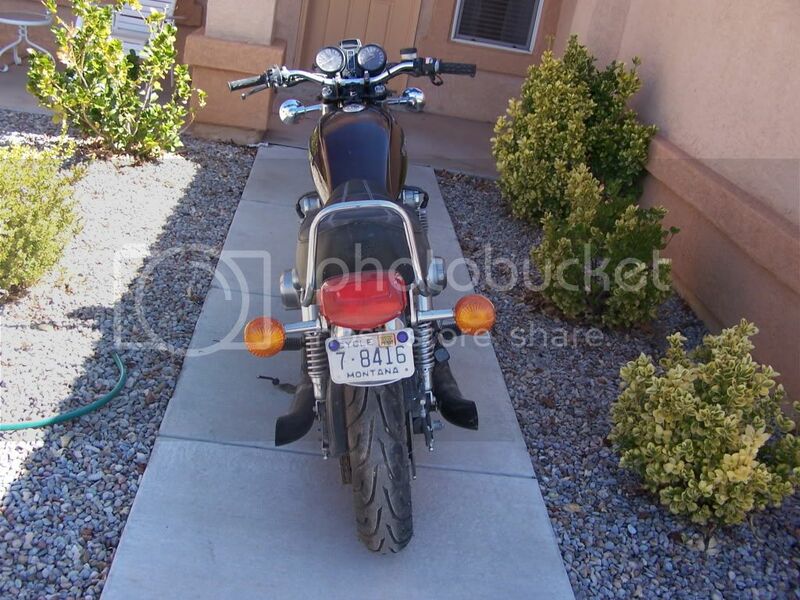 Keep in mind that the bike has been sitting for 3 years before the previous owner decided that he no longer wanted to store it and started throwing money at it trying to get it to start. He bought a new battery, got the tank cleaned and coated, and had the carbs done. All by the same bike shop. 3 years ago, he also bought new tires and had them put on by I believe the same shop, I can check my records on that one (he kept all of the receipts ). The battery that is in the bike is only a few months old and supposedly holds a charge when not attached to the bike. I have a spare battery from the XJ600 that I attached to the GS750 for a while trying to figure out if I could easily start it and kicked it over a few times. The previous owner, in all his police officer wisdom decided that he should try to fix her up. So, he pulled the tank off and removed something. He replaced that something that he removed with two inline fuel filters and new fuel lines for the and I quote, "the main fuel line and the reserve fuel line." I removed the reserve fuel line he added and replaced it with a vacuum line. I added some vacuum to the line and the petcock pulled fuel into the line and it looks like it passed through the fuel filter just fine. The tank was empty and I had a gallon of gas laying around that was a week old. So, I added the gas and tried kicking it over a few more times. No luck still. Just to make sure it was not the battery giving trouble, I hooked it up to my car and started her up, 13.6 volts on the dot constantly. So, I going to check over a few more things soon, but if anyone has some advice on these old girls, it will all be appreciated. I will be pulling the spark plugs and checking them when I get some more free time. P.S. She drained the battery from the XJ600 pretty quickly as after half an hour to an hour of it being plugged in and the ignition on, it was down to 8 volts. I also found out that every time I kick her over, she gains 0.05 volts. Also the starter does not work, I am not sure for what reason, but if the system can handle it, I want to remove the starter, starter solenoid, that part of the harness, the battery, and replace it with the proper capacitor and make her kick only. spark and carbs mate ...I bet theres some gunk in them gas bowls fer sure after 3 years .. I will have a check on those if it isn't the spark. I do not mind jumping head first into a deeply involved project, but it has to be an impulse, otherwise I will tip toe into the freezing waters. Never messed with carbs before. Just a little sea foam. I felt like a retard first time I went to get some and it was on a rack staring at my back. yep that seafoam will hide from ya ,kinda pricey aint it .. I have a third of a bottle left and have used it in two tanks on the XJ. It fires up nicely now, but the idle is not as smooth or is more noticeable now that it is smoother everywhere but. Last night and tonight it was 32 degrees or below when I went to start her up and she does not like cold weather. 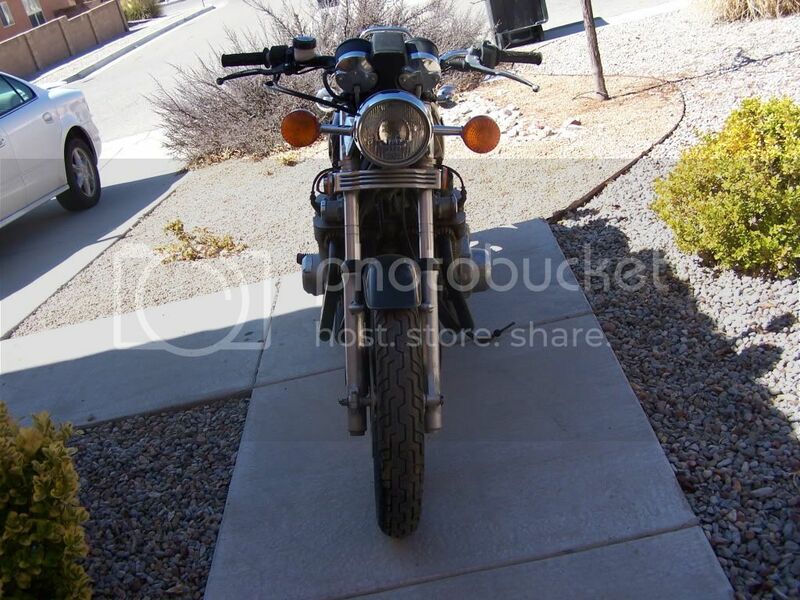 Before I get asked what direction I want to go with this bike, I will post up. First things first, get her started and working nice. Then I will think about doing some body work. I would like to have a longer tank that holds 5 gallons or so, but still mounts like stock and is a little more squarish with knee cutouts a seat level with bottom of the tank and some sort of pad. The tail will be about a foot long and I would like it to be an increasing radius starting with a vertical coming off the seat. The tail light being a slightly curved box set up with LEDs and hopefully if I can figure out a way, a single oval or trapezoidal undertail exhaust. 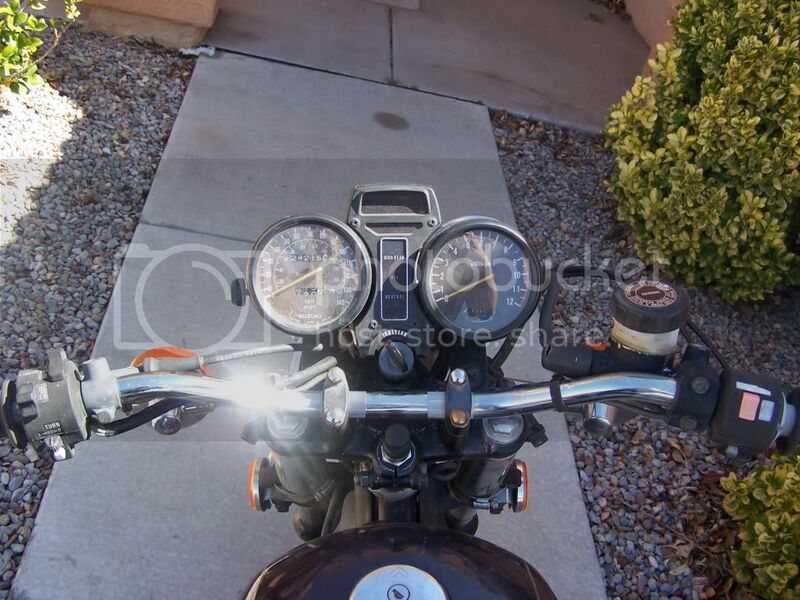 I will keep the 7'' round headlight, probably get a new one with better light output though. I would like to try my hand at the gauges shedonlie was thinking about doing for the parts buildoff. Keeping the sweeping speedometer and LED tachometer going clockwise from 6 O'clock with greens to yellows at 1 O'clock to redline at 2 O'clock and reds until 3 O'clock. I will try to make some visuals with these, or if someone is a beast with photoshop, I can try to describe these in the greatest detail possible. I will try to not buy off the shelf parts for any of this other than exhaust headers, midpipes(if available) , cans, and the head light and/or projectors. Then make sure your carbs a clean and the air mix screws are where they need to be. 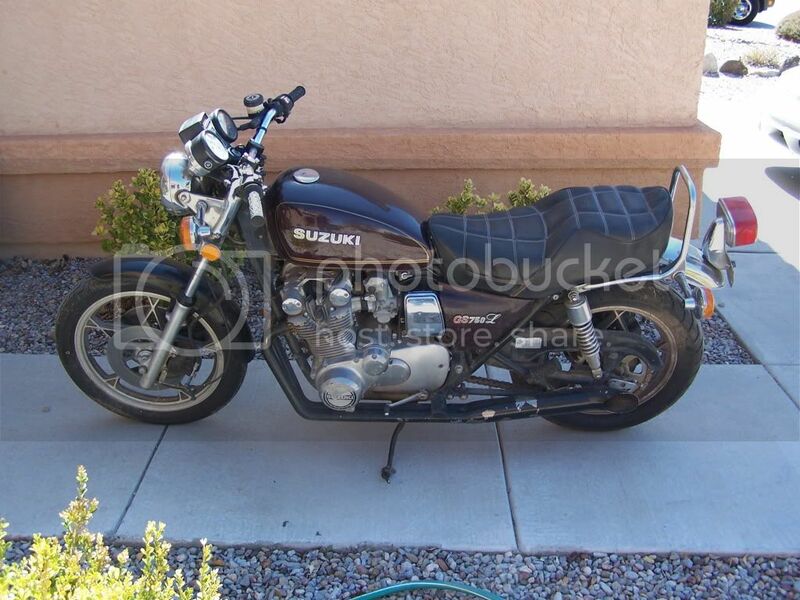 Thank you for viewing Casper's 1979 Suzuki GS750L in the Member Project Bikes section of our streetfighter motorcycle forum. I hope you found it useful!